Your Meade telescope cell phone holder will allow you to take pictures through the telescope. This is ideal for taking images of the Moon, planets, and other bright objects like star clusters. 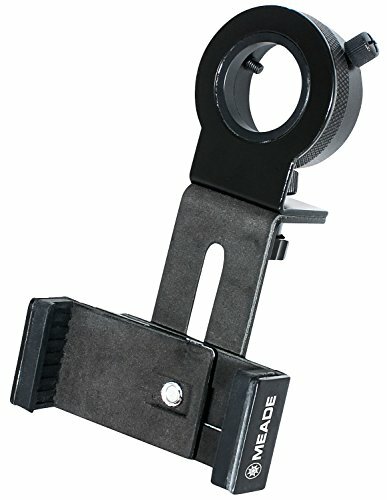 Meade's telescope cell phone holder is compatible with many cell phone types and sizes. Its design includes several adjustments that allow for correct positioning of the phone's camera into the optical path of the telescope. Fits cell phones with max Dimensions of 3.25"(82.5mm) width, 0.5"(12.7mm) thickness and of any height as the bracket is open-ended. If you have any questions about this product by Meade Instruments, contact us by completing and submitting the form below. If you are looking for a specif part number, please include it with your message.